Biotinylated Human NTB-A, His Tag, Avi Tag (NTA-H82E6) is expressed from human 293 cells (HEK293). It contains AA Gln 22 - Met 226 (Accession # Q96DU3-1). The protein has a calculated MW of 26.8 kDa. The protein migrates as 35-44 kDa under reducing (R) condition (SDS-PAGE) due to glycosylation. 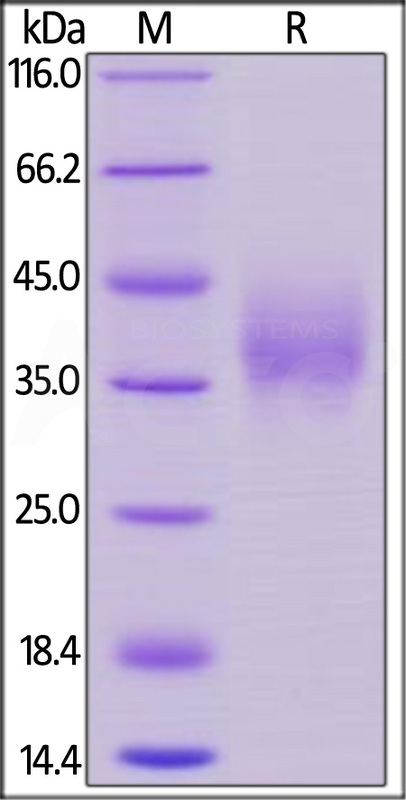 Biotinylated Human NTB-A, His Tag, Avi Tag on SDS-PAGE under reducing (R) condition. The gel was stained overnight with Coomassie Blue. The purity of the protein is greater than 90%. The SLAM family of receptors is composed of six members named SLAM (CD150); 2B4 (CD244); Ly-9 (CD229); CD84; natural killer, T and B cell antigen (NTB-A; Ly108 in the mouse. Most, if not all,immune cell types express more than one SLAM family receptor. All six SLAM-related genes are located within a 400–500 kilobase (kb) genomic segment on chromosome 1 in humans and mice. This feature implies that the genes that encode the SLAM family were created by serial gene duplication. (1) Veillette A., et al. 2007, Immunity., 27(5), 698-710. (2) Detre C., et al. 2010, Semin Immunopathol., 32(2), 157-71. (3) Nakajima H., et al. 2010, Semin Immunopathol., 32(2), 157-71.